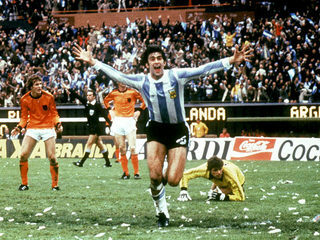 June 25, 1978: the day that Mario Kempes became immortal in his home country. Hosts Argentina faced the Netherlands in the FIFA World Cup final in Buenos Aires. Known as “El Matador”, the leading striker with his black, flowing mane put his team into the lead in the 38th minute. Nanningas equalised eight minutes before time and it was again left to Kempes to score his – and the team’s – second goal in the 15th minute of extra time and finally send the 72,000 fans in the River Plate Stadium into rapture. Bertoni’s goal just before the final whistle to make the score 3-1 sealed the blue and black victory celebrations on the confetti covered pitch. It was the first title for Argentina, the mother country of South American football. The “father of the triumph” was “El Flaco” (the thin one): coach Cesar Luis Menotti, a pronounced left-winger, who refused to shake hands with members of the military dictatorship at the victory ceremony. But the soul of the team was went by the name of Mario Kempes, a tall, dynamic left footed player, who won the Golden Boot after scoring six goals. He also rang in the great decade of Argentine football that included three appearances in the final up to 1990. With the exception of his successor Diego Maradona, no other star in Argentina’s football skies shone so brightly as that of Mario Kempes. “El Matador” was born in Córdoba on 15 July 1954. Mario started playing football at the age of nine. Seven years later he, the division’s top forward, led his team to the regional championship. Kempes made his debut for Instituto de Córdoba in the Argentine first division as a 19-year-old on 5 October 1973. The first of his 43 international appearances, in which he scored a total of 20 goals, followed only a little later. “He’s strong, has an excellent technique, creates space and has a powerful shot. 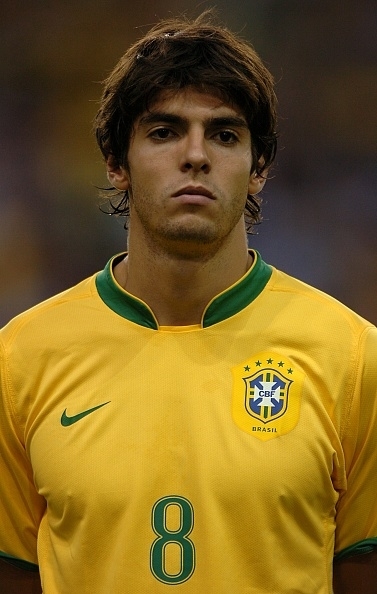 Players like him can decide games,” said the eulogistic coaching legend Menotti when talking about his favourite pupil. Kempes was considered a very fair player. He was never booked or sent off whilst playing for his national team. The Argentine took part in three FIFA World Cup™ tournaments (Germany 1974, Argentina 1978 and Spain 1982) and played in a total of 18 games. Kempes didn’t score at the 1974 FIFA World Cup™ and was party to, amongst other things, his team getting soundly beaten 4-0 by an electric Dutch team centred around Johann Cruff. It was, as he later admitted, a major motivation for the final four years later. In 1974 Mario Kempes moved to Rosario Central, where he scored more than 100 goals in only two years after which he was transferred to Europe. Valenciapaid a transfer fee of about half a million dollars for the striker. Kempes enjoyed his most successful period in club football there, winning two Spanish cups (1978 and 1979) and two European Cup Winners Cups (1979 and 1980), as well as the UEFA Super Cup in 1980. In addition, he was twice Spain’s leading goal-scorer – 24 goals in 1976/77 and 28 in 1977/78. He returned to Argentina for one season in 1981/82 and won the championship with River Plate. In the same year, Argentina, who included many of the 1978 winning team, travelled to the FIFA World Cup™ finals in Spain as one of the favourites. But the team weren’t able to repeat their success and Argentina were eliminated from the tournament before Kempes was even able to score his first goal. One year later, he handed on the No 10 shirt to the up and coming star Diego Maradona, who Mario Kempes described in his autobiography as being the man that, “helped give Argentine football world-wide prestige”. After the FIFA World Cup™ flop, Kempes again packed his bags and returned to Europe, at first to Spain and later, from 1986 to 1992, to Austria. A three year break and a short stay in Chile followed before Kempes ended his professional career in 1996 when a player-coach in Indonesia. “My country has been really lucky as we’ve been able to produce excellent players over and over again,” said Kempes in his typical modest way after retiring. The 1978 FIFA World Cup™ hero’s first coaching experience came as an assistant to Héctor Núñez at Valencia in 1993. After player-coach positions in Chile and Indonesia, Kempes worked in Albania (SK Lushnja) in 1996, Venezuela (Mineros de Guayana) in 1997 and in Bolivia (The Strongest) in 1999. The Argentine won his first championship as a coach with The Strongest before a move within Bolivia took him to Independiente Petrolero. Nickname: "El toro" | "El Matador"